Buy the Urban Legend hat too! Together with the scarf for only 2.9$! Extra long scarf, that you can wrap more times around the neck. It is matching to the Urban Legend hat. 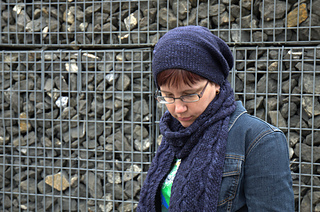 It looks great knitted from semisolid yarn, which makes the scarf interesting, but does not distract from the pattern – the cables will still be visible. 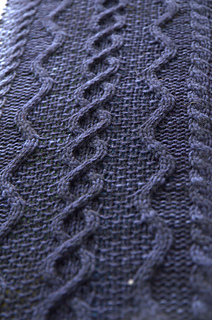 SIZE: one size, 20 cm x 196 cm (7¾ x 77 inches) after blocking. 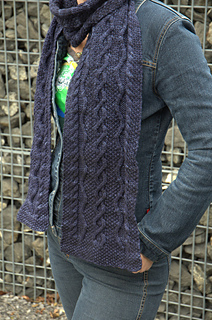 DIFFICULTY, SKILLS NEEDED: beginner, there are some basic cables in the pattern. NEEDLES: 4,5 mm (US 7) straight needles (or any size that gives you the right gauge). YARN SUGGESTIONS: 440 m (485 yards) worsted weight yarn. NOTIONS: cable needle, tapestry needle, 4 stitch markers. GAUGE: 22.5 sts x 24 rows in 10 cm (4 inches) in seed st.